Red pin -- As in a regular Google Map, the red pin indicates your current specified locations. When you open the map, a red pin will automatically appear marking the location of your currently-selected subscriber. You can change the position of this pin just by clicking anywhere in the map. Another red pin also appears when you have selected a tower in your profile box (see below) -- this second red pin indicates the location of your selected tower. Line of sight -- This is the black line that automatically appears to connect the red pin to the tower location you select. It represents the line of sight between the two locations. The line of sight is also detailed in the tower profile's Fresnel chart (learn more about this below). CPE pins -- These are the little green pins that mark other subscriber locations that have Customer Premises Equipment (CPE). Tower markers -- The larger blue markers indicate the locations of your towers and their respective tower equipment. Coverage shading -- The colors you see on the map represent the coverage of each tower equipment. 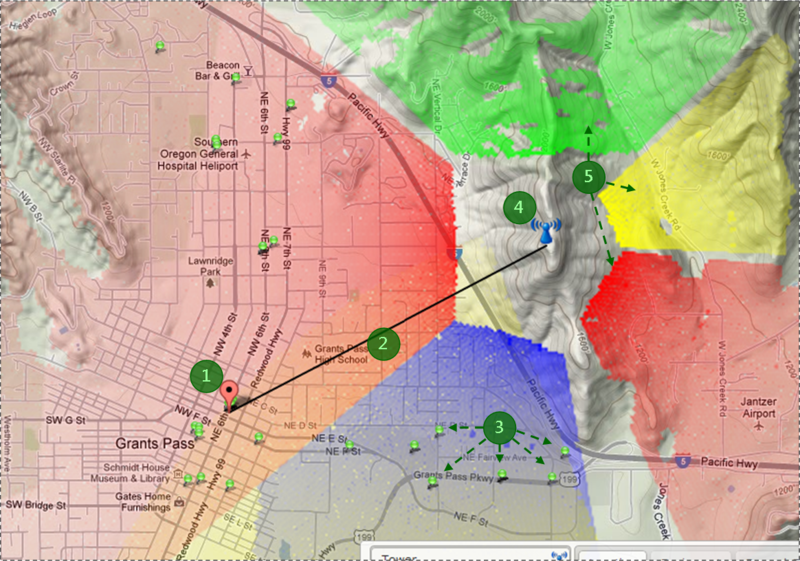 Because each coverage is from a tower equipment, each shading radiates from a particular tower marker. Also notice that any tower marker may 'produce' several coverage shadings -- this is because each tower may hold several equipment, each of which produces coverage of its own. Filters -- Your Saved Filters can also be used to filter which subscribers are marked (with CPE pins) on your map. Layers -- These are the types of equipment that can be displayed on your map: Tower, CPE, and Other. Simply check the layer(s) you want to be displayed, and/or uncheck the ones you don't. Print -- This generates a printable version of your map. Lat, Lng, and Address -- You can change the location of your red pin (subscriber location) by changing any of these three. A change in one of these will prompt an automatic change in the other two, and automatically update your map. 1) Location -- Your selected tower's exact location is displayed in this tab, in terms of both address and longitude/latitude. 2) Equipment -- This tab shows details of all the equipment located at your selected tower. The details shown here reflect those in your Equipment Manager's Tower Equipment tab. You can directly edit details here -- just make your changes directly into the fields, then click Generate (the small square button of a globe with a pin). 3) Fresnel Chart -- The chart in this tab is a graphical representation of the Fresnel zone between your tower and your red pin. You'll also see here the line of sight drawn with regard to the elevation of your tower. 4) Computation -- This tab is all about the calculations between the various numbers about your tower and its frequency (e.g. obstacle distance, frequency, etc.). You can change the value of any of these details and click Calculate to find out how any one of them affects the rest. 6) Settings -- Here is where you can customize settings such as your preferred unit of distance and the color and opacity of your map's coverage shadings.